On first start, it might take a minute before Senya Editor is fully set up. Once you see the trial notification the extension is ready. On subsequent runs the extension is initialized almost instantly. At the moment Senya Editor offers very basic completions, no validations and still has some parsing issues. In the next upcoming weeks you can expect improved specification parsing, more validations and better completions. 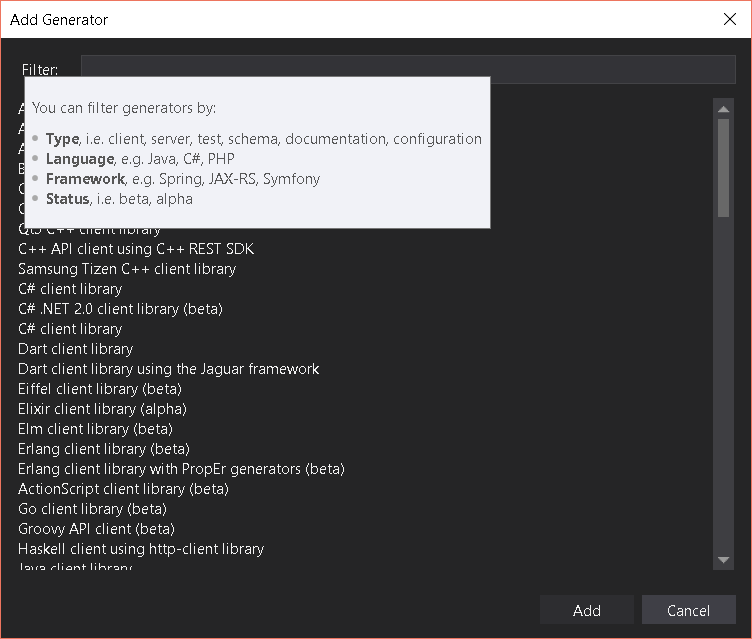 OpenAPI Generator can be accessed through the Tools menu in the Visual Studio menu bar. It allows you to run, configure, save and load one or multiple generator configurations at a time. Each generator has its own set of configuration options. When you hover over an option’s label or one of its combobox items, a tooltip is shown with extra information. Options are grouped where applicable for a better overview. More advanced options like type mappings and reserved keywords are currently not configurable through the GUI. You can load one or more OpenAPI Generator configurations. A JSON file containing either a JSON object or JSON array is expected. It is fully compatible with existing OpenAPI Generator configurations. Some parts of the configuration are currently not displayed in the GUI (e.g. type mappings, reserved keywords), but those parts are still passed to OpenAPI Generator when you hit the generate button. You can save one or more OpenAPI Generator configurations as a JSON file. A single configuration is stored as a JSON object. 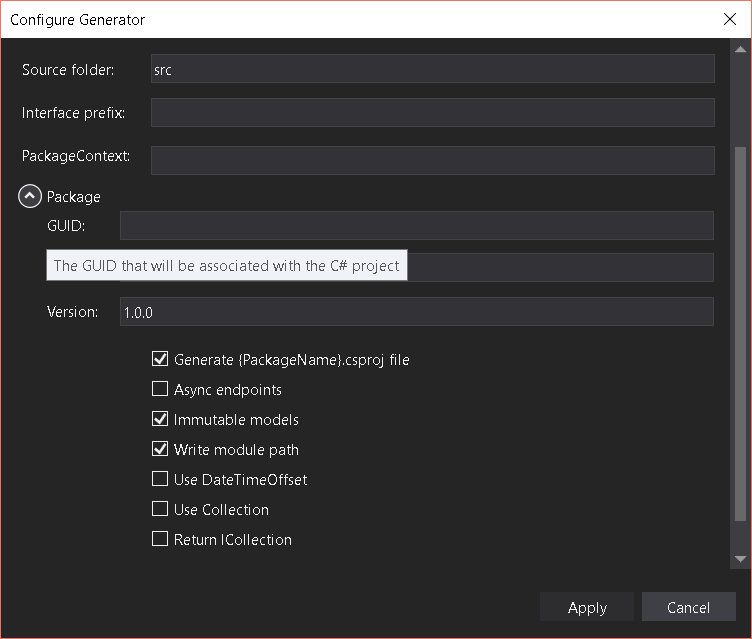 It uses the same configuration properties as OpenAPI Generator, so that you can use the saved configuration directly with OpenAPI Generator CLI or the OpenAPI Generator Gradle plugin. A single file specification is generated for each input specification, so that OpenAPI Generator is able to process the specification. This means that all JSON references that point to other files are localized and the schema it points to is added to the specification. OpenAPI Generator’s output is displayed in the output tool window. The output for each generator is shown in a separate console.